Asymmetric Scenic Petite Top is rated 4.5 out of 5 by 4. Offering style that's bold and bright, this unique top features stripe and floral patterns surrounding a graphic depicting a scenic view of a waterside city. An asymmetrical hem and a keyhole back add a trendy touch. Rated 5 out of 5 by Cathie Sue from love love love this top. 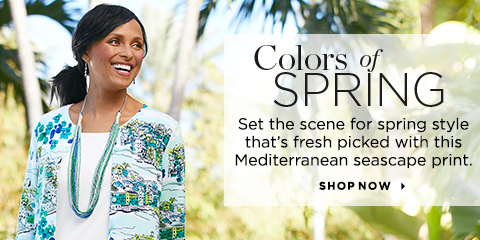 so flattering Beautiful colors, great fit, just right for spring. Rated 5 out of 5 by sugumama from Out of the box I really love this top. It is the only one I have with an asymmetrical hem. It goes with a lot of my spring/summer clothes. Rated 3 out of 5 by Lady51 from Nice colors I returned this blouse. Felt it looked like something for an older lady.